A 57-year-old veteran is suing Sonoma County for “negligence” after he says staff at the county jail delayed critical medical care, which left him nearly dead and wheelchair-bound as an amputee. In the lawsuit, Bryce Lemmons alleges jail staff “acted maliciously” and left him in his cell with soaked clothes for several hours before giving him dry clothing. Lemmons was arrested two years ago – just one day after Christmas. A police officer found him sleeping behind a Santa Rosa supermarket. According to the police report, it was “40 degrees outside,” and Lemmons was intoxicated and "shivering." His clothes were wet and, according to the officer, soaked with what was believed to be Lemmons’ own urine. Police arrested Lemmons for an outstanding shoplifting charge but first took him to a nearby hospital for medical care. “They said that if my body temperature would have dropped another degree, I probably would have died,” Lemmons told the NBC Bay Area Investigative Unit. Medical records obtained by the Investigative Unit show that hospital staff at Kaiser Permanente in Santa Rosa treated Lemmons for hypothermia. Bryce Lemmons was confined to a wheelchair after undergoing the amputation of his left leg and part of right foot. After he was discharged from the hospital, Lemmons was taken to the Sonoma County jail, where he says he was placed in a cell wearing his same wet clothing. Lemmons said he soon began to feel sharp pain in both of his legs. However, jail records show Lemmons wasn’t treated until he appeared before a judge on Tuesday. While in court, he complained about the pain in his feet and legs. A judge then ordered that Lemmons receive care immediately. Lemmons’ feet turned dark purple, and his toes became black. Both legs were diagnosed with gangrene, and over the next several weeks, all the toes on his right foot had to be amputated along with his left leg below the knee. Greg Brod, Lemmons' attorney, said the outcome would have been substantially different had jail staff responded immediately to his client's medical needs. "The facts show and will show that this could have been prevented," Brod said. "This should not have happened and the law should prevent this sort of thing from happening again." Bryce Lemmons was diagnosed with gangrene in both legs. Photos taken by hospital staff at Kaiser Permanente in Santa Rosa show the discoloration of his feet and toes. The Sonoma County Sheriff’s Office, which runs the jail, has officially denied all of the lawsuit’s claims. “Every inmate that comes in is screened for medical issues,” said Sgt. Spencer Crum, a spokesman for the Sheriff’s Office. While the department conducted its own internal investigation, Crum said the results will not be released publicly in light of the pending litigation. Crum told NBC Bay Area that he is unsure whether Lemmons was wearing wet clothing or a dry hospital gown while inside the jail. However, he said that to deny Lemmons medical care would have been a break in protocol at the jail. “That would be extremely unlikely, especially if someone were to (display) that type of condition,” he said. Sgt. Spencer Crum is a spokesperson for the Sonoma County Sheriff's Office. Crum said officials at the jail were aware Lemmons had just been diagnosed with hypothermia about an hour before arriving at the facility. However, the NBC Bay Area Investigative Unit obtained internal documents from the jail that appear to show confusion about Lemmons’ condition. In one internal document, jail staff wrote that Lemmons had not been treated at a hospital before arriving to jail, but another document said Lemmons did receive medical care for "leg pain" and "hypothermia." "We strongly believe Bryce was wronged," Brod said. "To deny someone medical care is cruel and unusual punishment." Also named in Lemmons’ suit is California Forensic Medical Group, the private company contracted to provide medical care inside the jail. The company contracts with 27 counties across the state to provide medical care at correctional facilities. 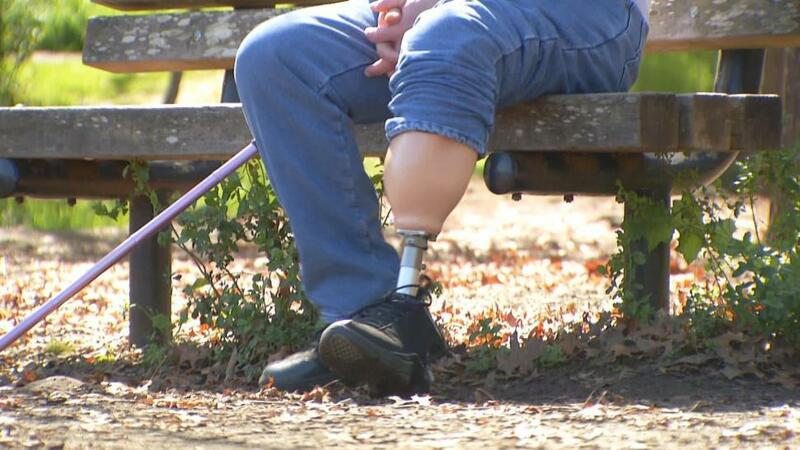 Lemmons was recently fitted for a prosthetic leg and can now walk with a cane. He says each step forward is painful. His case is expected to go to trial next year.